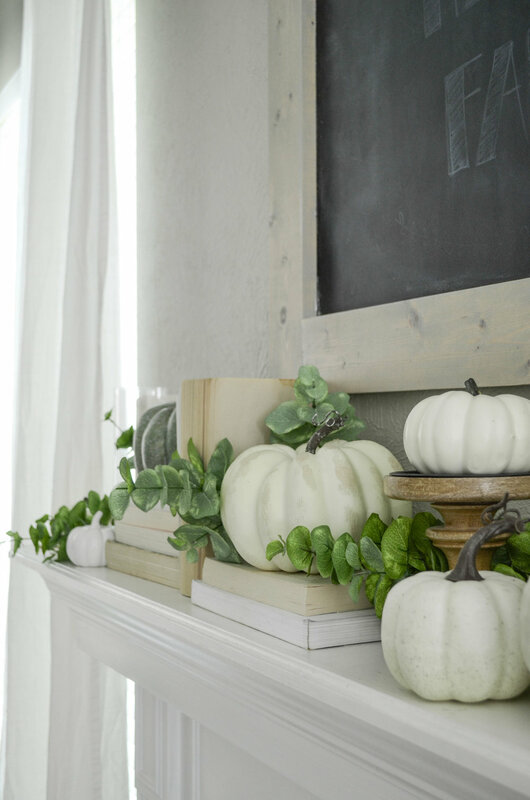 Who's ready for some neutral farmhouse fall mantel goodness? Ok, I admit it. I was kinda lazy this year with my fall decorating. I didn't buy many new pieces, and I re-used almost everything from last year. Does that make me lazy? Maybe it just makes me resourceful? But, let me just keep it real for a second. Not many of us can go out and buy all new décor every single season. Ain't no body got time (or storage space or money for that!). So I re-used a lot of what I already had in ways I hadn't used them before: a DIY chalkboard, white pumpkins, greenery, candles, and books. All simple things that you probably already have on hand and can use to re-create a similar look in your home. And I added a super easy DIY Fall banner (I literally just taped chipboard letters to jute string with scotch tape--and that's all. (I like the way it looks so much, I'm gonna have to head back to the store to get letters to spell "happy" or hello" to hand with the "fall"). I knew this year I wanted to keep with a non-traditional neutral color scheme, and I really wanted to try incorporating books into my fall mantel. I'd seen it done before, and knew it would give my mantel a neutral, farmhouse-y feel, and add some texture. If you look carefully above, you can see the remnants of my attempt to hand letter "happy fall." It was a miserable fail. Know what was an even bigger fail? Forgetting to "cure" my DIY chalkboard after I made it. If you don't cure the board, everything you write on it will be pretty close to permanent and impossible to erase. But don't worry! If this happens to you, a magic eraser (and some serious muscle) will take care of the problem. So, I just got in a hurry taking these pics before I had fully erased it all. Forgive me. I love the texture this fabric pumpkin adds to the mantel. I picked this guy up at Target last year, (along with his white ceramic buddy you see up there), but I haven't been able to find any fabric pumpkins this year. Fabric pumpkins, where are you all hiding?! When I began creating this mantel, I just pulled out a bunch of books and pumpkins, because I knew those were the two main things I wanted in this year's fall mantel. But as I was putting it all together, it was even too neutral for my neutral-loving self. So I grabbed some faux eucalyptus and began tucking it here and there. I think it's exactly what this mantel needed. The other thing I did as I created this mantel was switch everything up. A lot. I kept re-arranging pumpkins, putting this one over there and that one over here, and adding an extra book here or there. I just kept moving things around until it all felt right. In the middle of it all, I went to Target. And that's when I found that tall beauty right up there. It's exactly what this space needed. And I'm thinking I kinda need to go buy some more. Thanks for checking out my fall mantel, friends! For loads of other Fall décor inspiration, follow me on Pinterest and Instagram or check out my Neutral Fall Home Tour. And don't forget to check out the fall mantels of these super talented blogger friends of mine!